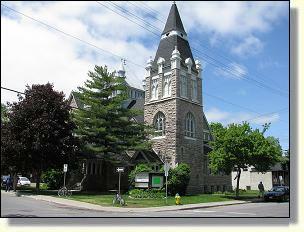 Most of our concerts take place at Glebe-St. James United Church, at 650 Lyon Street South in Ottawa. Glebe-St. James is located on part of the 1837 Crown grant of 178 acres made out of Clergy Reserve lands to be "a Glebe to the Clergymen of the Church of Scotland" (Glebe means land set aside in support of the Church). Glebe-St James opened its doors on Lyon Street around 1905. Its sanctuary contains a three manual organ installed by Casavant Brothers in 1929. There is ample free parking available on streets surrounding the church. From the 417, take the Catherine Street exit and keep straight onto Catherine Street. Turn left onto Bank Street (third street from the exit). Turn right onto Clemow Avenue (third street down). Then turn left onto Lyon Street. The church will be on your right hand side at the next intersection. From the 417, take the Bronson Ave. exit and turn right onto Bronson. Then take a quick left onto Chamberlain Avenue. Then turn right onto Lyon Street. The church will be on your right hand side at the fourth intersection.